Miss Laurel was just showing me her acetates. Not the Marx Brothers one; this is the Howard Hawks screwball comedy with Cary Grant as Barnaby Fulton, a chemist who discovers the formula for the fountain of youth. Except that the effects last about eight hours and might be likened more to an Acid trip or Ecstasy binge (increased energy, sexual desire, feeling like you’re 20 years old etc) than a permanent elixir. Which came first, Monkey Business or Cary indulging in psychedelics? What it really does is gives the leads (Grant and Ginger Rogers as Edwina Fulton) a chance to do some age inappropriate acting. First behaving like they’re bright young things (although Rogers, at 41, was hardly decrepit) then, under the influence of a mighty dose, back to children. So like Tom Hanks in Big, then. Grant gets to display his acrobatic skills (backward somersaults) and Rogers her dancing (she also impressively balances a teacup on her forehead, lying down then gets up with it in place). The latter stages quickly grow tiresome; there’s only so much of Grant playing “Indians” and attempting to scalp lawyer friend Hank (who has a barely disguised thing for Rogers) you can take. A number such elements haven’t aged particularly well (the blasé attitude to animal testing included), but the real problem is that the script isn’t there. 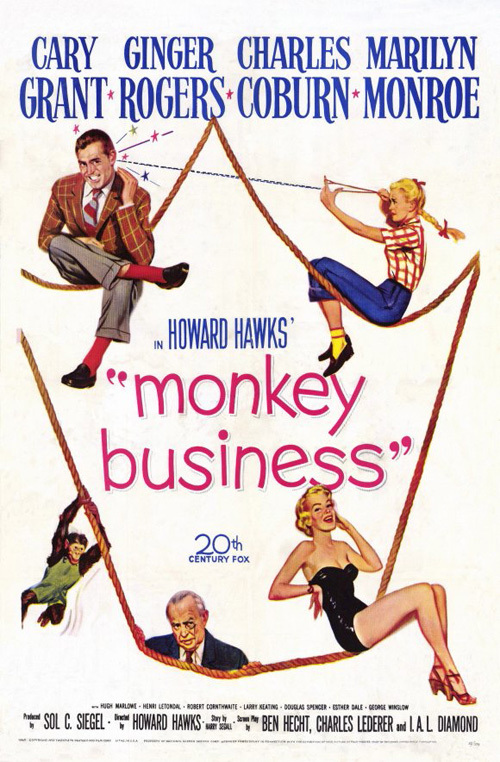 The snappy dialogue we associate with the likes of Hawks’ Bringing Up Baby and His Girl Friday is rarely in evidence (there’s a witty telephone call full of wordplay with Grant’s boss Charles Coburn early on) and the scenarios aren’t inventive enough for such a whacky premise. Edwina: Oh, you mean that little pin-up girl? Very cute. Barnaby: Sort of. But half infant. Edwina: Not the half that shows. Ironically, the best parts of the film are consistently those with Marilyn Monroe as Lois Laurel ( the name of Stan Laurel’s daughter), Coburn’s inept and none-too-bright secretary with an impressively reinforced bra. Coburn employs her for decidedly lascivious reasons (“Anyone can type”, he comments after sending Monroe to find someone who can finish his work properly. During his first trip, Grant spends the day trying to impress Monroe and the pairing works much better than between Grant and Rogers (I agree with Peter Bogdanovich on that). Coburn deserves credit too as the boss desperate to rediscover his youthful libido. There’s a fair amount of suggestiveness and innuendo throughout but the unfortunately the film as a whole feels like a faint echo of the past glories of both Grant and Hawks. George Winslow (best known for his role as Monroe’s wealthy child admirer in Gentleman Prefer Blondes) is amusing in his second film appearance (Grant discovered him). And, altogether now, "Terrify tissue!"